Rocket Science with Tim Peake! As members of the RHS Campaign for School Gardening, St Paul's has been successful in being selected to take part in the Rocket Science Experiment, led by Tim Peake on the International Space Station. 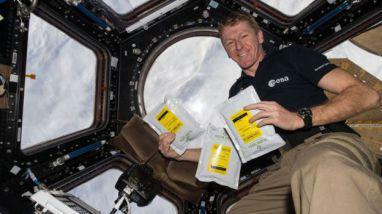 The experiment will give our pupils the opportunity to learn about growing plants in space. Two kilograms of rocket seeds were launched on Soyuz 445 on 2nd September and are being held in microgravity at the ISS until their return in March 2016. St Paul's will receive 100 of these seeds together with 100 that remained on Earth to plant and compare their growth. Leading scientists from the RHS and European Space Agency will interpret the results and draw possible conclusions. This is a very exciting project and we are thrilled that St Paul's will be contributing to science exploration in their way! You can follow this project more closely on the RHS website and will be informed of our results when the experiment is complete later in the year! Click here to see Tim Peake talking about the project. We had an amazing day with children dressed as characters from Roald Dahl's books. The coffee morning and afternoon were both great successes raising £595. What a fantastic display! See the cakes below that Mary Berry had to judge - a very difficult task. All of us at St Paul's thank Mary Berry very much for fitting us into her busy schedule - dashing back from Saturday Kitchen Live! in Manchester. I am sure she has inspired another group of bakers.